Our top 10 of the best League skins in the history. Our chart with YouTube videos and description of each LoL skin. There are many wonderful skins in LoL and everyone decides what skin he prefers most. In this guide we just represent our view of top 15 of best LoL skins in the game history. Before you starts to read our chat let us recommend you our LoL elo boosting service! Due to the low quality skin standarts in the past, in this article we will consider only skins of the “modern era”. Oh, these clouds! This golden and sunny version of Wukong illuminates the poor story of his previous skins. The main idea of this skin is the cartoon clouds which are looking awesome and a bit funny. This epic skin with cost of 1350 RP has a new voice filter, animations of abilities and recall animation. Also Wu gets high-speed animation in this case he is levitating on the cloud (during homeguards effect etc). When Radiant Wu dies he turns into the stone. 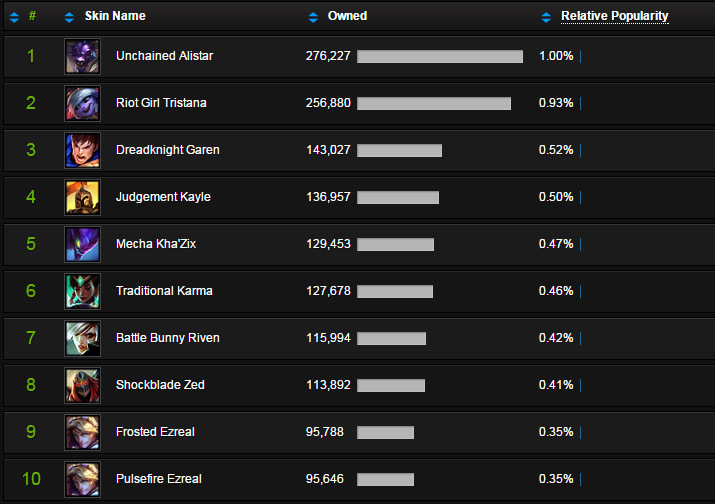 This an epic tier skin for Kassadin takes top 14 in our chart of top LoL skins. With look of a futuristic cultist, Kassadin offers us amazing cosmic animation and sounds effects. When he casts spells Kassadin draws beautiful constellations. Stars is a theme of this skin and you will see them a lot in abilities or during recall. This is definitely the best skin for Kassadin. Despite that LoL was released more than 5 years ago there was no classic sorcerer in the game: with a beard, spell book, scrolls and magic hat. Finally, we got it all in this wonderful Ziggs skin. This epic tier (1350 RP) skin was released recently and it is amazing! Ziggs tosses magic carpets, bags with sorcerer staffs and arcane crystals. Sorcerer look is awesome, this skin is very detailed and even when Ziggs dies he drops pair of golden rings. This Fiddlesticks skin is quite old but it has very developed and amazing concept. Fiddlesticks looks like a real party guy with whistles, whirligig, balloons and even an inflatable poodle! This skin is very detailed and made with love that brings a fun into the game. It’s really nice to fear your enemies with party whistle! Should be mentioned that Surprise Party Fiddlesticks has new sounds what is very rare for the common skin tier (975 RP). That feeling when community meme came true. Since Darius release people were joking about him as dunkmaster due to how his ultimate looks like. This community joke made Riots to release this legendary tier skin (1820 RP). Darius constantly stuffing the ball, runs with the basketball hoop, his passive ability now leaves balls around enemy instead of drip of blood and when he ultimates he does the slam dunk! Of course, this skin has a new voiceover and sounds as any other legendary skin these days. This epic tier skin (1350 RP) is the reference to the Raiden from Metal Gear Solid. Yasuo as the cyber-samurai looks awesome and stylish, orange color of ability animations may remind Deus Ex and Metal Gear universes. Many of us love cyberpunk and hi-tech swordmans from the future thus Riot Games found the best champion to make skin with such theme and that job was done with impressive result. Also there is a new recall animation with some acrobatics. However there is no true new voiceover that’s why this skin is only in the top 10. Despite the fact Teemo has the the biggest amount of skins in the game, developers are still up to make new ones for him and the most recent legendary skin (1820 RP) in LoL was also made for Teemo. This second legendary skin for Teemo may remind sand people from the Star Wars franchise. Teemo looks very stylish as tiny spec ops soldier with knife, rifle with the laser sight and plasma mines. This skin has new sounds, completely revoiced and has amazing recalling animation when Teemo tumbles to the base. New epic tier Jayce skin (1350 RP) brings this champion to the dark side. Seems like developers are trying to avoid abuse of dark or undead themes in the game thus we don’t have many skins that bring champion from good to evil. Jayce looks awesome, in his new look he reminds dark inquisitor. All his spells have new red and dark-blue colored animations. The only reason why this skin doesn’t belong to the legendary tier is because it wasn’t revoiced. However this skin has some kind of the filter what makes usual Jayce phrases sound threateningly. A pair of years ago it would be 100% legendary but today it’s amazing epic skin (just compare it with legendary Gatekeeper Galio). Nice idea to put a dragon instead of usual Tristana’s canon brought this legendary skin (1820 RP) to our chart. One of the most wonderful things in this skin is how Tristana interact with her dragon pet. Dragon acts like is a cute tamed drake and looks very natural. Overall this skin is a pure reference to the nice cartoon movie “HOW TO TRAIN YOUR DRAGON”. There is a reason why video review of Dragontrainer Tristana got over 2 million views, that’s why it’s better to watch it by yourself. Ezreal’s appearance changes with level ups, he is completely revoiced and has his own analogue of Jarvis or Cortana (AI that speaks with Ezreal). All his ability animations and sounds are new. He also has different walk animations (depending on his move speed and level) and pretty stylish futuristic look. Janna as weather forecaster is the pure fun. She starts commenting events on the map since the very beginning and don’t stop doing that until the end of the game. This legendary skin (1820 RP) makes Janna’s abilities summon clouds, lightings and hurricanes. Animation of the ultimate is very fun to watch but in this case better to see than to hear. As mentioned before she has an amazing revoice and this is the best in this Janna skin. Also her dance in this skin is the reference to the popular song “I’m singing in the rain”. Annie has lots of skins but the newest Hextech one is the best. Steampunk theme may remind universes like you could see in a popular anime Full Metall or such great games like Arcanum, Dishonored or Bioshock Infinite. Engineer outfit with cool glasses, dress and techno-glove is far from the best in this skin. You will understand it when you will see how Tibbers looks like. And he looks absolutely awesome! This huge steam golem appears on the battlefield with fearsome animation and starts melting everything apart with his strong techno-paws. This skin is obtainable through crafting system. Riots continue cyberpunk theme with their series of project skins. This legendary tier skin (price is 1820 RP) for Yi is really awesome: stylish power armor, energy sword, amazing sounds and voiceover. Visual effects require special attention. You will see very nice movement and attack animations with combination of well painted abilities in the green-orange gamma. The best thing in this skin is that during ultimate the form of Yi’s sword changes to the glaive and he starts to hit enemies completely differently. It may remind Darth Maul’s double-bladed sword or Demon Hunter weapon from Warcraft universe. Seems like selling of this ultimate skin was great because DJ Sona was even awarded with forbes article! In each of her stance she has a new amazing look and plays different music track. DJ Sona is the best skin Riot Games made so far but we decided to give a first place in our chart to the another candidate. Zombie Brand was the limited legendary skin of harrowing 2012. This skin is the pure fun. We all love zombies and this zombie was made with love. He dances as Michael Jackson and when he chases a champion he stretching his arms towards him. He has wonderful undead revoice, hilarious movement animation and wonderful green fire. Hail the king of our skins chart – Zombie Brand! As bonus let’s make a top 3 chart of LoL skins in which development game and graphic designers invested their humor and jokes to make them really fun to play. Veigar was stylized as the final boss from arcade games of the nineties. His glove reminds gamepad as well as all his sound and animation effects allegedly came from old console games. Abilities were made in pseudo pixel style and leave a great impression. When Veigar dies he explodes in the scattering pixels which leaves a humorous effect. In this legendary skin (1820 RP) much effort has been invested by designer and it worth buying if you really love Veigar! Snowballs, penguins and icicles everywhere! The most wonderful thing is that champions who travel through Tempered Fate (Bard’s ultimate) they are being transformed into the cute penguins. Also Bard dance animation with his comic penguin friend is really nice. One of such joke friends follows him everywhere during Bard’s movements. And don’t forget that instead of heal shrine you are getting cup of cocoa! Price for this skin is 1350 RP. As second bonus we will make a short chart of top LoL ward skins! Price for all wards is 640 RP. A nice looking globe which was made in steampunk style. Finally, we got a stylish skin made as support for series of skin in the PROJECT theme. As mentioned in the beginning of this article, everyone decides on his own what skin is the best. So what is your favorite LoL skin? I would defenitely add knockout lee in this chart but it was released recently and i guess before this chart was written! I own all Janna skins including the one which i get as reward for season 2 or 3, don’t remember. Forecast one is pure joy among them! I don’t understand why Zombie Brand is always number 1 in everyone’s lists. It really doesn’t look that good. His awkward walking is just as annoying as Hiemerdinger’s. Despite that we have lots of more detailed skins now, ZB still has unbeatable charisma plus it’s limited which make it more valuable. What about Veigar’s little hop thing? Most of these skins are based on whether you like the champion or not, so while DJ sona is awesome… If you don’t like sona it’s just not that exciting. zombie brand isn’t even a good skin. Bard’s E, Magical Journey is what you travel through and get turned into a penguin with, not his ult. Wow, most of these skins are fashionable, i would like to have it all, but some of them are so expensive! Simply awesome skins! Where developers take so many inspiration and imagination, fancy designs that do not cease to amaze. Of course, I understand that this chart is created according to the personal opinion of the author, but still. How was it possible to give the first place to the Zombie Brad? He is so banal. And why is there no Elementalist Lux? She’s just beautiful and each of her new skins looks great. Although this skin can not have been when the guide was created.